Some time in early 1980, I went to an exhibition of heraldry at the British Museum in an attempt to discover why so many coats of arms featured the heads of Africans. At the time this was of interest to me because (along with Ziggi Alexander) I was researching for an exhibition for Brent Library Service entitled Roots in Britain: Black and Asian Citizens from Elizabeth I to Elizabeth II. While I was admiring the 60-foot long Westminster Tournament Roll which formed the centrepiece of the heraldry exhibition, I was suddenly stopped dead in my tracks. I could hardly believe my eyes: one of the six King’s trumpeters depicted on the Roll was an African. He was even depicted twice. In one image he was wearing a green turban and in the other a purple or brown one; otherwise his uniform was the same as that of the five white trumpeters, who were bareheaded. Ziggi was as excited by the find as I was. We obtained a photograph from the College of Arms and permission to use it in Roots in Britain, and then we contacted the librarian of the Armouries at the Tower of London to see if she could tell us anything more about this intriguing man. The librarian replied that he first appeared among the payments made to members of the King’s household in 1508 when he was paid 20 shillings in the month of November, which she assumed was half a month’s wages. This was all we were able to report about him on the exhibition caption. We didn’t know his name. Digital reproduction of images hadn’t been invented then. As the budget for the exhibition was tight, most of the images we used were black and white, but we splashed out for a colour photograph of John Blanke. The picture was small and rather pale by today’s standards, nevertheless it caused a lot of comment when the exhibition opened as it was from a far earlier date than any of the others we were able to find. 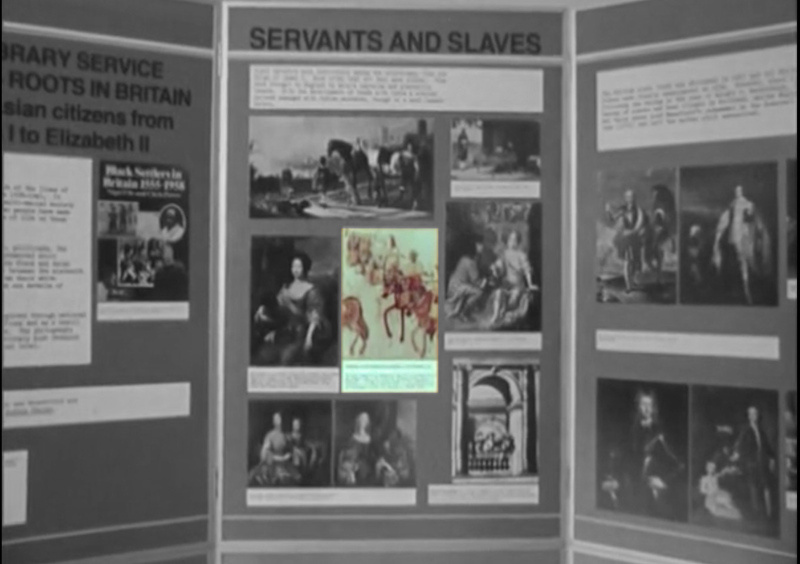 Roots in Britain was turned into a travelling exhibition which toured the country for several years. 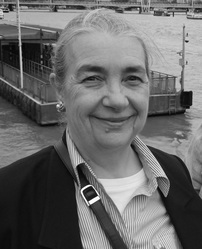 Ziggi was interviewed about it on ATV and there is a video of the programme on this link: https://vimeo.com/64159239 John Blanke isn’t mentioned in the interview but his image, in the centre of the second top panel, appears near the beginning of the film, just as the commentary starts. I believe Roots in Britain was the first time that his image was connected visually with Black History. Of course it has been much used since then and in the process it has gradually transferred from being known to academics only into the domain of the general public. In 1984, Peter Fryer wrote about John Blanke in his monumental book, Staying Power: The History of Black People in Britain (pp. 4-5). He had first seen the picture in the touring version of Roots in Britain which was on display at the International Conference on the History of Blacks in Britain held at the University of London Institute of Education on 28-30 September 1981, at which he gave a paper. As he acknowledged in his preface to Staying Power, he “learnt much” from our exhibition. Peter’s meticulous research led him to Sydney Anglo and he listed “The Great Tournament Roll of Westminster, ed. S. Anglo (1968)” and “Sydney Anglo, ‘The court Festivals of Henry VII: a Study Based upon the Account Books of John Heron, Treasurer of the Chamber’, Bulletin of the John Rylands Library, XLIII (1960-1)” in his footnotes (p. 460). Staying Power was unillustrated, so the image wasn’t included, although it was described in detail. The image next featured in the GLC exhibition A History of the Black Presence in London in 1986 and was depicted in black and white in the book that accompanied the exhibition. John Blanke was mentioned in a sentence (but not illustrated) in David Bygott’s Black and British (p. 9), published in 1992. His picture was used again in Hakim Adi’s The History of the African and Caribbean Communities in Britain, in 1995. This book brought John Blanke’s story to the attention of a younger readership. 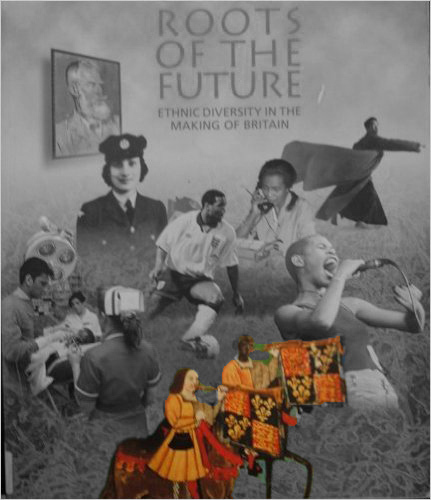 The image was probably most widely seen when it was featured on the poster, and cover of the accompanying book, for the Commission for Racial Equality’s exhibition Roots of the Future which opened in 1996 and toured the country for some time afterwards. It was also printed as a greeting card which could be bought at the exhibition.